When Big Island residents want a change of pace they often take their families camping at Kalopa State Park. The quiet serenity of the nearby forests and the area’s natural beauty along the Hamakua Coast invite you to relax and unwind. Now imagine being able to live here in a spacious, gorgeous newer home with a large fenced yard and peek-a-boo ocean views! New to market, this property offers privacy and beauty. The gated private home, which is fully fenced, sits on 1.06 acres of landscaped grounds with tropical fruit trees and expansive lawns in the front and back yards. 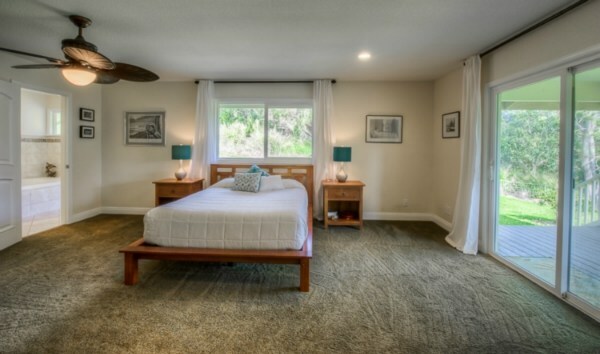 Located at 44-3222 Kalaniai Rd., this spectacular single-story home is within walking distance to Kalopa State Park and only a short drive to Honoka’a, Waimea, or Hilo. Built in 2007, it’s obvious from the moment you step into this large, 3 bed/2.5 bath home that great attention was paid to every detail of its 1,838 square feet of living space. The large master bedroom and en-suite bathroom is a private oasis unto itself as it’s separated from the other two bedrooms with access to an outdoor shower area. In the master bathroom you’ll find top of the line contemporary bath fixtures and his-and-hers glass bowl sinks set off against a rich, warm wooden vanity. 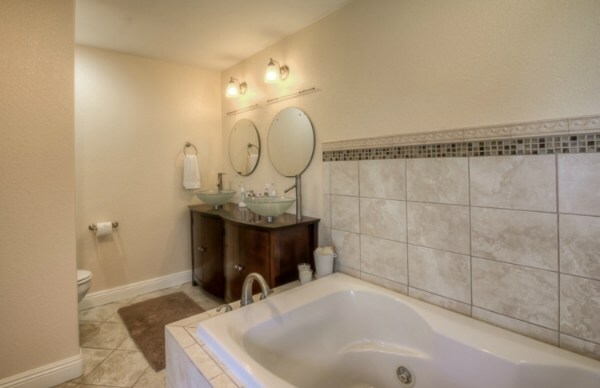 There’s also a soaking Jacuzzi tub for relaxing. The walk-in closet in the master bedroom, like all the closets in this lovely home, features custom built-in organizers. While the bedrooms are carpeted, the great room, kitchen, and dining areas all feature custom Brazilian Teak hardwood flooring. The great room also features a wood-burning stove to take the chill off cool nights and high-end ceiling fans to enhance the tropical trade winds. Relaxed and comfortable are two words that spring to mind when I see this great room. 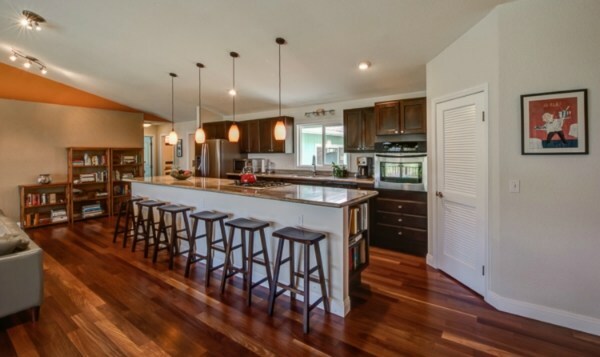 The kitchen makes entertaining easy with a granite-topped island – so large it seats six! Stainless steel appliances contrast nicely against custom solid-wood Alder cabinets. Whether cooking a weeknight dinner or for a large holiday party, there’s plenty of counter space and storage in the kitchen. 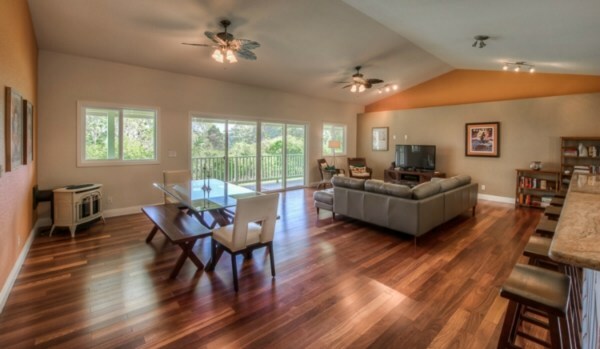 There’s also plenty of room for entertaining in the dining area and great room. One of the things I love about this property is that from the kitchen you can gaze straight across the great room through the double slider doors and out to the covered lanai and incredibly large backyard with ocean views in the distance. The wrap-around deck is great for dinner parties or just relaxing with a cup of tea and a good book. If you have a green thumb, you’ll appreciate the raised garden beds and variety of fruit trees in the big – and I mean big – yard. Here you’ll find banana, mango, tangerine, orange, and guava trees providing you with a bounty of tropical fruit throughout the year. 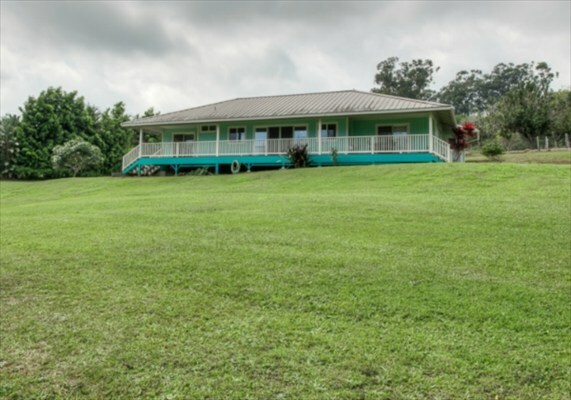 If you’re looking for a large and beautiful home along the Hamakua Coast, this wonderful home near Kalopa State Park checks a lot of boxes. If you’d like more information on this and other Big Island homes for sale, give me a call today at (808) 937-7246, email me, or call Julie Keller at (808) 987-7931 or email Julie@HawaiiLife.com.